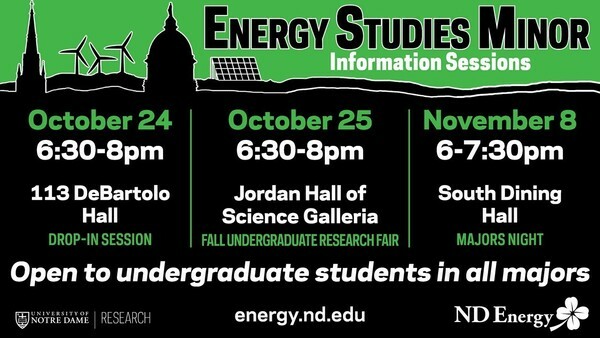 Visit the ND Energy table at Majors Night and learn more about the Energy Studies Minor. The minor is open to undergraduate students in all majors and colleges at the University of Notre Dame. The minor offers courses in business, ethics, history, theology, philosophy, anthropology, economics, archeology, policy, social science, and psychology in addition to many technical classes that explore the complexities of energy and the challenges of climate change. Students draw from both technical and non-technical courses to learn how to help move our country and the world toward a more sustainable energy future. If you are unable to attend this information session and would like to discuss the minor, contact Anne Berges Pillai at apillai@nd.edu or 574-631-9106 to set up an appointment.